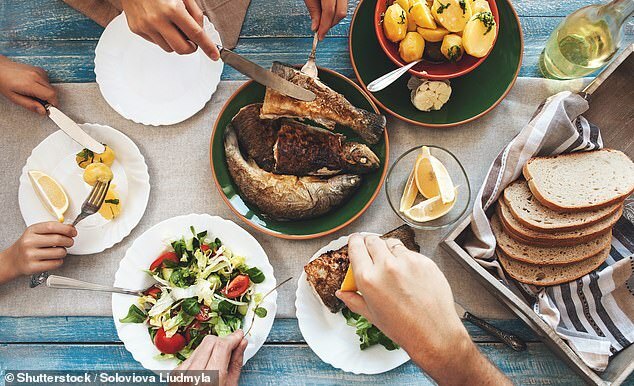 Family meals really do improve teenagers’ diets and put them on a path to healthy eating in later life – even if home life is dysfunctional, according to a new study. Researchers surveyed more than 2,000 families in the US, and found unequivocally that kids who grow up with at least two family meals a week ate more fruit and vegetables, and fewer burgers and fries. The impact was strongest on boys, they found, who were far more likely than girls to eat mainly junk food if they hadn’t grown up with family dinners. It is hardly the first study to suggest the power of family meals but researchers say it’s more important than ever to investigate and share these findings as obesity rates soar, and teens become more reclusive. ‘Frequent family meals were associated with eating more fruits and vegetables and less fast food and take-out food for young people in both high and low-functioning families,’ lead author Kathryn Walton, a nutrition PhD candidate at Guelph University in Canada, said. In the UK, only a third of Brits eat in the dining room – compared to just under half who use the lounge. The dinner table is now only used for special occasions – and a fifth of UK homes don’t even have one. In the US, the family dinner is still a strong part of culture. Around 88 percent of Americans say they regularly eat with other members of their household. A bigger issue in the states is that most Americans (around 90 percent) don’t like to cook, preferring take-out, which doesn’t pack a nutritional punch. But for this study, Walton and colleagues found family meals did encourage adolescents and young adults to have healthier diets and eat less fast food. This was regardless of other daily domestic routines, communications and emotional connections. Walton said: ‘Eating meals, particularly dinner, with family members has been associated with improved dietary intake among youths. Using data from 2,728 participants aged 14 to 24 her team combined dietary questionnaires and family functioning models. These were based on factors such as educational attainment of mothers’ spouse or partner and household structure. The links between the meals and healthier food consumption did not change when family functioning was taken into account. Family dinners fuelled more fruit and vegetable consumption among males and females. They also had fewer fast food meals. It is recommended children eat five portions of fruit and vegetables per day. Those who always eat together are more likely to achieve this. Watching parents and siblings eat teaches good habits, experts say. Walton said: ‘Adolescence and young adulthood are vulnerable life stages for the development of obesity. ‘Poor dietary intake has been identified as a key risk factor for excess weight gain among these populations, with diet quality often declining from childhood to adolescence and young adulthood. It’s been argued family dysfunction may interfere with organizing and preparing healthy meals. She added: ‘Our results suggest family dinners are an appropriate target for improving youths’ dietary intake.